If the bearing ball cage breaks down in a cartridge bearing, the inner bearing race can disengage from the outer when the balls bunch up at one side of the bearing and drop out of the assembly. 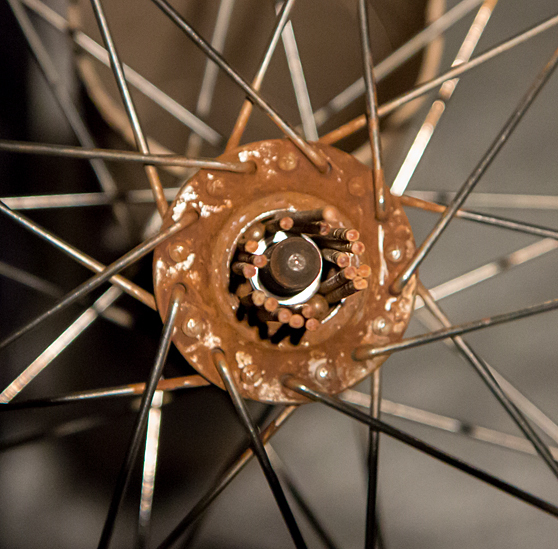 If this happens with a press-fit cartridge bearing in a bicycle hub, the outer bearing race will be extremely difficult to remove from the hub without special tools. Normally, worn cartridge bearings in need of replacement can be removed by tapping the axle from the opposite side, but the separated outer race of a disintegrated bearing will have nothing for the axle to interface with. The fit between the hub and the bearing into the hub is often very tight, and attempting to cut or otherwise brute-forcing the bearing ring from the hub can permanently damage the softer metal of the hub. If you still have the inner race of the ball bearing (and the balls or access to some*), you can use this method to temporarily reassemble the bearing enough to be able to tap out the outer race from the hub. Orient the wheel vertically and place the six balls in the bottom of the outer race. Then put the inner race on top of them and carefully push three toothpicks between each ball so that the distance between them becomes approximately uniform around the bearing. Keep adding toothpicks until there is no place for more and the whole assembly is jammed tight. The bearing unit can now be hammered out with the axle from the opposite side of the hub. Stop tapping at regular intervals and check that the toothpicks are still tight. *The 6000-2RS type front hub bearing in the above pictures used six balls measuring approximately 4.6mm. 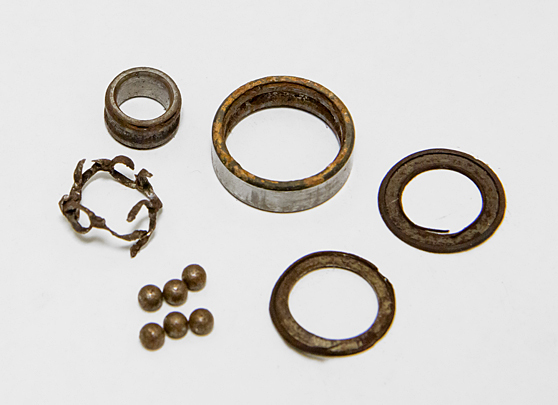 They were very worn, so they probably started life as standard 3/16 inch balls (4.76mm) which can be purchased cheaply in small quantities online, as that size is also used for traditional cup-and-cone front hub bearings.